It’s being very hard to find time to write any substantive blog just now, though I have sufficient queued up that by the time me saying this finally emerges and you read these words this may no longer be true. Anyway, I haven’t quite finished praising Jennifer Davis and Michael McCormick’s The Long Morning of Medieval Europe yet, much though you may wish I had, and it’s time for another dose. Lastly Stuart Airlie, as it should be wherever Carolingian power is in discussion, wraps up , emphasising the communications that held the Empire together and demanding more comparison with other empires in an attempt to challenge and refine whatever we think is ‘Carolingian’ about all of this, rather than just, well, successful.4 As he says, if we can’t identify that properly any talk of change before, after or during the Carolingian era is decidedly questionable, to which I say, indeed and don’t we know it who work on the tenth and eleventh centuries and consider Charles the Fat still fairly early? So, well, I aim to help, in the long run, with this programme he throws into the air, but these articles will all help when I do. 1. Janet L. Nelson, “Charlemagne and Empire” in Jennifer R. Davis & Michael McCormick (edd. ), The Long Morning of Medieval Europe: new directions in early medieval studies (Aldershot 2008), pp. 223-234, with the key text given in translation as an appendix; if you want Jinty explaining the whole system, of course, you should read her “Kingship and Royal Government” in Rosamond McKitterick (ed. ), The New Cambridge Medieval History vol. II: c. 700-c. 900 (Cambridge 1995), pp. 383-430. 2. Matthew J. Innes, “Practices of Property in the Carolingian Empire” in Davis & McCormick, Long Morning, pp. 247-266. 3. Jennifer R. Davis, “A Pattern for Power: Charlemagne’s Delegation of Judicial Responsibilities”, ibid. pp. 235-246. 4. Stuart Airlie, “The Cunning of Institutions”, ibid. pp. 267-271. 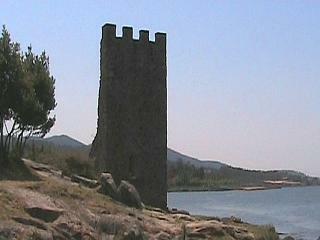 Eleventh-century Vikings at the Two Towers? At the time of writing, which at current rates is something like three weeks behind appearance here, when at work I am mainly doing copy-editing of a certain book that it would be tactless of me to identify, given what I’m about to say and what I think of its chances of actually emerging. 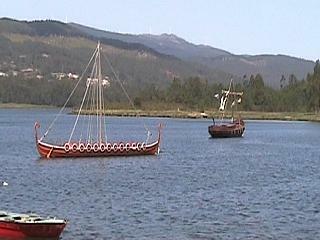 However, it has set me on a hunt, because it mentions as an unreferenced throwaway that the city of Lugo, in Galicia, north-west Spain, was sacked by Vikings in the early eleventh century. Now, I will confess, it was news to me that the Vikings were anywhere near Spain then, but it transpires that actually Norse sea-raiding was The Genuine Problem at that time and there was certainly enough of it to become a cliché in relic translation narratives and so on. However, sacking a whole city? There are books that ought to mention this and they don’t. However, Richard Fletcher’s St James’s Catapult, so much more than an incomprehensible title, does find a quote from Sampiro’s Chronicle suggesting that Lugo was threatened and also says that Tuy was sacked, which we apparently deduce from episcopal vacancy and which is associated with a serious raid of 1015-1016; this association appears to go back to Ramón Menéndez Pidal’s La España del Cid but Fletcher was suitably cautious so I guess no-one actually says straight out that the vacancy was the fault of Vikings.1 I will check Sampiro, but I think this bit has to come out, or at least be heavily modified. That wasn’t actually what I was going to talk about. 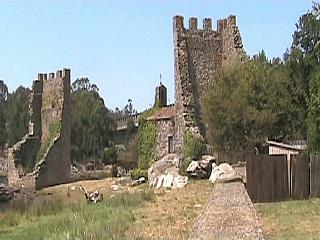 While searching the web for something that included Lugo in the relevant destructions, I found this, a write-up of a visit to a place in Galicia called Catoira. Here stand the Torres de Oeste, ‘Towers of the West’, which are alas two opposite ends of a ruined castle through which a road has been driven. Before that mishap this place Catoira apparently did pretty well using this fortress to hold off Viking attacks, and indeed English ones hundreds of years later, and every year the town has a festival celebrating this. 1. Referencing Richard A. Fletcher, St James’s Catapult: the life and times of Diego Gelmírez of Santiago de Compostela (Oxford 1984), online at LIBRO, last modified 16 August 2000 as of 17 October 2009, p. 23 & nn. 52 & 53, and Ramón Menéndez Pidal, La España del Cid (Madrid 1934), 2 vols, transl. H. Sutherland as The Cid and his Spain (London 1934). I have to be brief here at the moment, given claims on my time, which is ironic because as you all know I find it much easier to go on at length. Rare is the day when I don’t hammer out something on the keyboard; even my e-mails have on occasion been printed out as booklets to be read on trains, so loquacious do I get in text. This is how come I wind up with fourteen draft papers, of course; I find it a lot easier to think in text than to organise material inside my head. But I feel bad about pointing this out sometimes; it’s certainly annoyed those close to me struggling with writer’s block in the past, and there has been a lot of this on the Interweb, this late lamented summer, among people I read (largely collected here and heroically fought here). I don’t want to write self-help here or preach or assume any kind of superiority. The people who are having problems with words are all, after all, in better jobs than me; they have got some important things worked out. I, meanwhile, pontificate academically rather than finishing things and making marks. But I can write. So I thought I’d at least try and explain how I set about it, and if it’s useful that’s great and if it’s not it can at least document my freak status a bit better. I can’t go on at length because I have to write, ironically: I am only just keeping up with the lectures, which is the kind of writing I enjoy least; unless one’s very lucky one uses them once only, has no chance of feedback from the informed, and fundamentally they are only a script, not to be stuck to rigidly, lest the dozy audience are sent even more quickly to sleep. There is no sort of writing less rewarding than this. But it has to be done. And that’s the key really. Let’s work from outside inwards. Environment fretting is an excuse for procrastination. It is a limited amount of help to me to have a clean desk, I find that physical clutter is easily mirrored in my head but I often have to plan on trains, in snatched minutes at work, add paragraphs here and there between house-work and meals, and it’s possible. If you know what you need to say, it can be done, and if you don’t, there’s your first problem. So fix that first then ensure your environment is better next time, perhaps. Planning can never be too detailed. I’ve certainly written, or delivered, things from a short list of bullet-points; in fact that was what I aimed to take into all my undergraduate exams in my head. That said, it only works if those bullet-points link to fully-developed ideas in your head, and if you’re doing new work those ideas probably aren’t fully developed. There are a bunch of ways to plan writing, most of which don’t suit me; I just scribble stuff on a piece of paper then try and put it into a sensible order once I’ve suitably conditioned, erased, supplemented or otherwise tweaked it. But that’s not the start; how do you get off the blocks? OK, this is the only trick I might have; and maybe you all did this anyway and I’m insulting your intelligence, sorry. But, though you can write for writing’s sake, if you want to communicate you can make that the core of your planning. Firstly, what is your big idea? If you had to give an elevator pitch, what would the one-sentence argument of your paper be? Don’t verbalise it yet. Instead, picture to yourself the personification of your target audience. Imagine that what you are writing is a personal letter to them. Imagine that they wrote asking you to tell them about your topic. What do they need to know to understand that idea? Write those things down as keywords or headings. What is the established view, how does your view differ? Or, if you’re presenting new evidence: what is known, what are you adding? How does this show what you want it to show? Can you summarise that for them now? Work out, in other words, how you would tell this to a friendly and intelligent audience. What would they need to know to get it? How would they most enjoy being told your theory? These are the things that I think need to be in the plan. With this accomplished, you presumably have a lot of bits that eventually have to go into an order, even if they all refer to each other. These bits can be done separately. (If they can’t, you may need to clarify them.) You may find that you can work up a skeleton full of headings, and then fill it out bit by bit; these headings may not need to be in the final text. Do it when you can, but don’t drop it and come back to it ages later; trust me I know. Write your plan while it can stay in your head, and if it can’t, write smaller chunks of plan and fill those out. Think of it as something the recipient could refer to if someone asked, ‘hey your friend is doing some work on x, right; what does she think?’ Give them what they need to explain to that interlocutor. And eventually you have a first draft. Do not slow yourself down by looking things up while writing, or if you can bear it, while planning. That way lies shiny distraction and sidetracks. Write your argument, then source it. If parts of it don’t really seem to be sourced where you remembered, this is an okay time to find out; it’s a shame to have to throw away done work but your thinking now has a structure and you can more easily rebuild than build. And this, as I say, more or less works for me, as these thousand-plus words would seem to testify. It’s been many years forming up as a method, and if it saves you some time that’s great. If not, call it weird and flawed by all means; after all, I don’t have very much in print. But the words, it does make. Maybe for you also. Martínez analyses the Historia Wambae as literature, but reckons that because it is actually deviating from the type-scenes it’s exploiting in some important ways, the real path of the events it describes lies underneath like lumps under a blanket (my simile, not his). Shanzer wonders whether the type-scenes of history and literature aren’t distinct, but I wonder more seriously whether one can apply this argument, which I use happily for charters—when they deviate from the formula there’s a reason—so easily for literature, where the reason is not going to be as simple as, ‘there really was a dovecote in the courtyard but they didn’t have any meadow’.3 In short, are we actually sure that Julian of Toledo was writing history not literature, I mean, was it even meant to be true? This question has been asked in other contexts lately by Magistra and the discussion there has obviously influenced where this one goes; as so often, her blog helps me think about this stuff, so thanks are due. Lastly, as I say, Ziolkowski gathers the very disparate historiography of early medieval weaponry—this is not the sort of subject that gets a lot of work, in part I think because it is seen as boy’s-own-history pursued only by wargamers, which is just daft given how much work has been done, for example, on ploughs and even stirrups—and so work has to be cited from the last hundred years rather than the last ten. Nonetheless, he gathers it, and finds references in the Waltharius both to current and antique weapons, and there rather runs out of steam. He is, however, I think quite correct to say that it’s only by this sort of endeavour of filling out the author’s world that we will come to be able to place the text better in its context, and I think this is the newest direction of the three, though obviously there is a need to work out why there are weapons from several periods being referenced and what the poet thinks they mean. I mean, did you get the phrase, “clunky Germanic weapons wonk” in your breakfast reading? To whom else could we go for this stuff? But anyway. There was a second point. As I say, everyone here is engaged in trying to find truth in fiction, or at least, in records of misapprehension. It comes down to, “is the author right or wrong?” Now, maybe this is me hanging out in the wrong places but it seems to me that this approach needs, well, theorising. Because, you know, surely this is an area where literary criticism and investigation has something to tell us, the investigation and criticism of literature? Even if we want to know something as old-fashioned as ‘what was the author doing here’ there are more sophisticated, if perhaps less scientific, ways of proceeding than comparison to known historical data. All of the authors do have some discussion of the method and effect of the author’s choice of words and literary tactics, especially Martínez but the others too, but I would like to see some readings of these sources inspired by more wide-ranging approaches and I wonder then if the questions we would ask would throw some extra light on these ones. 1. Paul Edward Dutton, “Observations on Early Medieval Weather in General, Bloody Rain in Particular”, in Jennifer R. Davis & Michael McCormick (edd. ), The Long Morning of Medieval Europe: new directions in early medieval studies (Aldershot 2008), pp. 167-180; Joaquín Martínez Pizarro, “The King Says No: On the Logic of Type-Scenes in Late Antique and Early Medieval Narrative”, ibid. pp. 181-192; Jan Ziolkowski, “Of Arms and The (Ger)man: Literary and Material Culture in the Waltharius“,6 ibid. pp. 193-208; Danuta Shanzer, “Representations and Reality in Early Medieval Literature”, ibid. 209-215. 2. Dutton, “Observations on Early Medieval Weather”; Shanzer, “Representations and Reality”, p. 211. 3. Martínez Pizarro, “The King Says No”; Shanzer, “Representations and Reality”, pp. 212-214; cf. Allan Scott McKinley, “Personal motivations for giving land to the church in the eighth century? The case of Wissembourg” in idem, Martin Ryan & Jonathan Jarrett (edd. 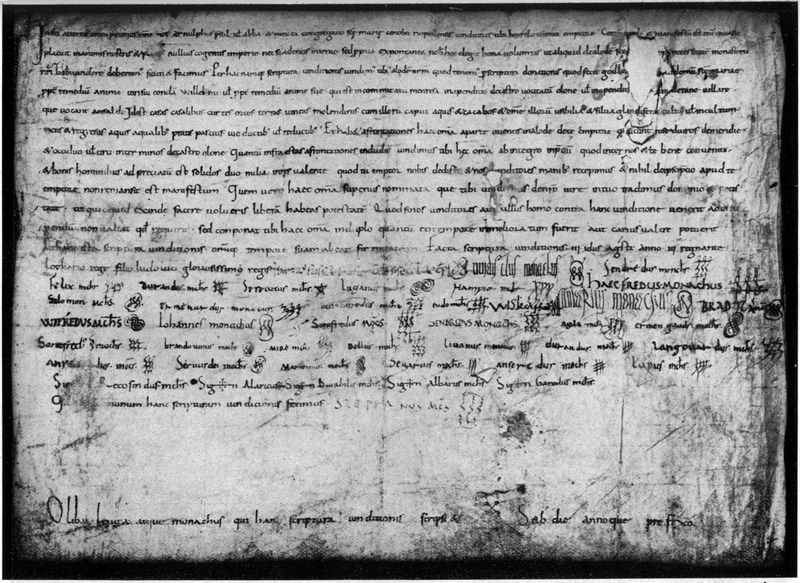 ), Problems and Possibilities of Early Medieval Diplomatic: history from charters and charter critique (forthcoming). 4. Ziolkowski, “Of Arms and the (Ger)man”, p. 203. 5. Shanzer, “Representation and Reality”, p. 215. 6. I wish he hadn’t used the pomo brackets though; anyone who gets the joke at all doesn’t need them. Right, this has gone on too long, which is more or less the point of the thread indeed but the time has come to wrap it up and make some pledges. Because, you see, I have a bunch of papers kicking around that are finished, ready to submit, in fact in some cases have been submitted and come back unloved, but this doesn’t mean I’m throwing away that research. No: these should be out there working for me and gosh-darnit I intend that they shall go out once more. There is no room in the 2-up, 2-down of my brain for academic output that has now fully grown to be lounging on the mental sofa eating crisps and claiming there’s no journals to apply to for work. Get out! I shall name and shame them. Oldest first: “Bishop and Brother: kindred and Church in an early medieval noble family”. This was a part of the thesis that kept getting cut. Never quite essential enough to make the grade, I gave about half of it as my first ever Leeds paper and then bound it as an appendix to my thesis to try and counterbalance the fact that I’d hardly considered the Church. At least, it seemed that way at the time but really, on rewriting stuff for the book it seemed to me that really, there was quite a lot of Church in it and I’m not sure why I was worried. Anyway. The other half of it is summarised in the book, but the two halves still belong together because the original catch was just that: it’s about Bishop Sal·la of Urgell and his brother Viscount Bernat of Conflent, who around the year 1000 are easily visible collaborating as a family to maximise their wealth and power but who use completely different tactics to achieve their individual aims. The point is a contrast of lay and clerical modes of power, and all it needs, I am convinced, with a couple of recent articles on related people assimilated at least, is a rewrite to make that agenda louder and then I have two journals in mind for it, one UK and one actually in Catalonia. I would like it to go the latter more because it would get me seen by the people in my actual field but it goes to the former first because that will get me seen by people who might hire me. Next time, Catalonia, next time. OK, next up. “Archbishop Ató of Osona: false metropolitans on the Marca Hispanica”. I first gave a version of this at a conference in 2003, and the first proper write-up some time in the next year after I’d learnt a lot more about papyri, which feature heavily. I have given about half of it here as a blog post, but only half. The trouble is, it’s huge. I sent it to a journal Gesta knows well a while ago and they came back saying “we like it but you need to cut it by half, somehow” and the reviewer was quite snippy about what bits weren’t contributing anything. If I’d cut everything he suggested, though, half the point would have been gone. So I consulted Professor McKitterick and she suggested an entirely different journal which would probably have it uncut. And then, to my great shame, I didn’t get round to it. Right, well, that’s enough of that. I have made a rapid attempt to check for related work, believe that I have found the most obvious examples and this one will now be next out the door, before even the Leeds papers book paper item because all it needs is formatting and submitting. Now, given its size that’s still no negligible task but it is stupid that I have not done this and I hereby pledge that this will end. “Documents that shouldn’t survive: preservation from before the archive in Catalonia and elsewhere”. This was put together in something of a hurry for Leeds 2008 and turned out to be one of my better papers even if I fluffed the delivery somewhat. Several people told me I should publish it forthwith as it’s important, or so they think, and suggested some very high-profile journals they thought I should try. And there’s really only two things I need to read for it and they’re both short, or at least the parts of them that need reading are short. But I can’t, because it’s based on Lay Archives work and I’ve been asked quite firmly not to do anything with that work, at least until the project itself has managed to publish. But because I have so much else that needs finishing, though it grates me I see no point in causing an upset by pursuing this until all concerned parties agree that I can. “Legends in their Own Lifetime? The Late Carolingians and Catalonia”. Mentioned already, born out of the twin wombs of “The Continuation of Carolingian Expansion” and “The Identity of Authority” fertilised by the pressing need to come up with something for last year’s Haskins Society conference. This actually turned out to be a good paper, or so I thought, and on good advice I got a professor who’d been there to critique it for me. Now all I have to do is revise according to his criticisms and send it off. Furthermore, a high-end journal already saw a version of this back when it was still basically “Continuation” in argh 2006 and they came back with a friendly revise-and-resubmit, which I should therefore have done straight away and maybe I’d have a job now. But I didn’t, because I wasn’t happy with it and it wouldn’t have been as good as I wanted. Now, this version is that good, so I think the first thing to do is to send it back to the same journal and see if they want it still. Failing that, another journal has actually asked me for it, so if its first home no longer has space or interest, they shall get their wish. This is another easy score and it will therefore go into third place on the list of shame, because I really don’t have an excuse for not having it done by now. 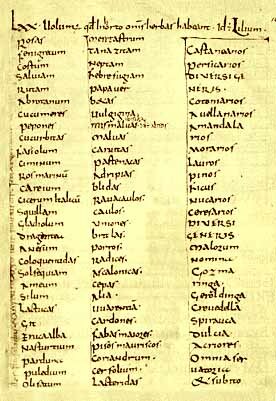 Lastly the newest: “Nuns, Signatures and Literacy in late-Carolingian Catalonia”. Fresh from delivery, this one of course has a home, and when I say it’s finished I mean that I think it could be printed as it is and it would shame no-one involved. However, there is actually a lot more work on nuns in early medieval Spain than I have read, and I want to take Wendy Davies’s advice from my viva and make sure it’s in my thinking before I submit the final version. So perhaps it should have been in the previous version, as all the relevant reading is currently on my desk but there’s still a fair whack of it. Nonetheless, I intend finishing this one very soon, because I have done enough things for Professor McKitterick rather too late and by halves and this will not be another of them. So, er, I make that fourteen papers I have in some sort of form without having done enough to get them published, and that’s ignoring the fact that I was contemplating a second book… This is really not helping me. There is a point of view that says that one can’t actually drop everything one’s working on to concentrate on one at a time and to do so would make me unhappy, it’s true. But this is just stupid. There is a need for a resolve of sorts. So, here is my pledge. I will revise, format and submit “Archbishop Ató”. I will do all the necessary reading for “Uncertain Origins” and make sure that it isn’t me who is holding up the Leeds volume. I will try and do both of these in the next three months, but I won’t promise the timing because of now being teaching and having other papers in final stages, book about to reach proofs and so on. However, I will do it at the earliest feasible point. Then I will revise and submit “Legends” and then I will concentrate on “Succession to the Fisc” until delivery time and then we’ll see what happens next. I knew this would happen. The more of Michel Zimmermann’s huge thèse I read, the less likely I get to be able to conduct a civil conversation with him, even though I learn a lot as well. If I had to sum this difference of perception up, I would usually say that I find it difficult to believe as easily in the influence of the people who request charters made in what the scribes then write, especially when it comes down to word choice. But here I am also coming up against a broader issue which I suppose is just down to how huge the pile of evidence we share is. This problem is, Professor Zimmermann is revelatory about what one can see in the vast Catalan charter material, but I can often fault him when he asserts that something cannot be found in the material. Assertions of evidentiary silence when there’s so much background noise are always going to be risky. … toute une catégorie de religieux, les moniales en l’occurrence, reste étrangère à la culture écrite. … a whole category of religious, to wit, nuns, remained strangers to written culture. … Guischafredus, auteur d’une donation commune avec sa femme Eilo en 955, tient à préciser que seule la maladie l’empêche de souscrire. De crainte sans doute d’être confondu avec sa femme dans la même inaptitude! … Guiscafred, actor in a donation made in common with his wife Elo in 955, makes sure to specify that only frailty prevents him from subscribing, doubtless for fear of being confused with his wife in the same ineptitude! « Sans doute », Prof. Z.! I mean, isn’t that the first possibility that occurs to you, dear reader? No? No, me neither. I think it’s supposed to be funny, but I wouldn’t have let it go to the printers myself.10 It leaves me wondering whether three pages in twelve hundred on women and repeated denials of nuns’ ability to write should really be put down to missing some key charters, or whether there’s a more basic problem here. 1. Michel Zimmermann, Écrire et lire en Catalogne (IXe-XIIe siècle), Bibliothèque de la Casa de Velázquez 23 (Madrid 2003), 2 vols, I pp. 86-91. 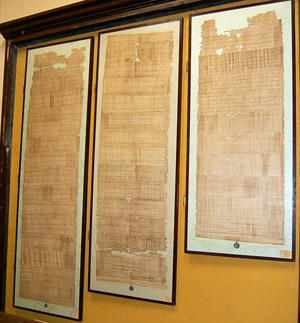 The charter is printed in (and scanned from) Federico Udina Martorell (ed. ), El Archivo Condal de Barcelona en los Siglos IX-X: estudio crítico de sus fondos, Textos 18/Publicaciones de le Sección de Barcelona 15 (Madrid 1951), doc. no. 139. 2. Zimmermann, Écrire et lire, I p. 89. 3. Ibid., I pp. 89-90. 4. 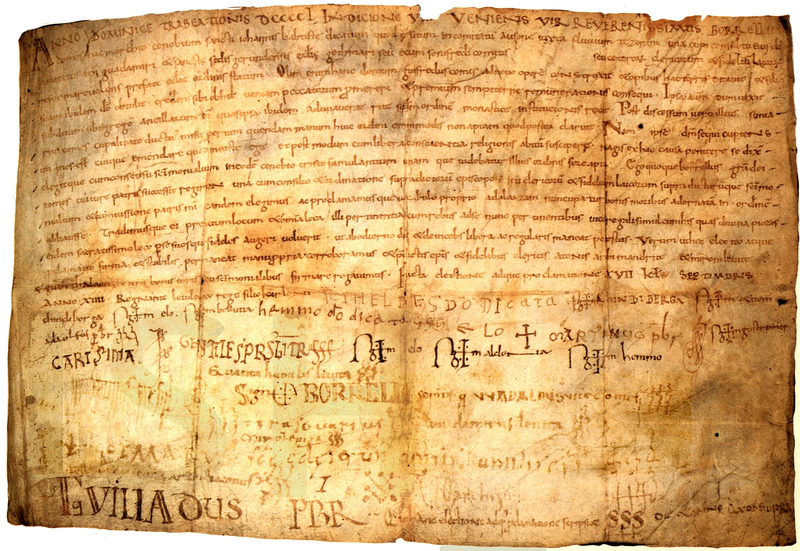 The nuns’ charter is Udina, Archivo Condal, doc. no. 128, but I mentioned that already. 5. Edited in Udina, Archivo Condal, and Eduard Junyent i Subirà (ed. ), Diplomatari de la Catedral de Vic, segles IX i X, ed. R. Ordeig i Mata (Vic 1980-1996), 5 fascs. 6. 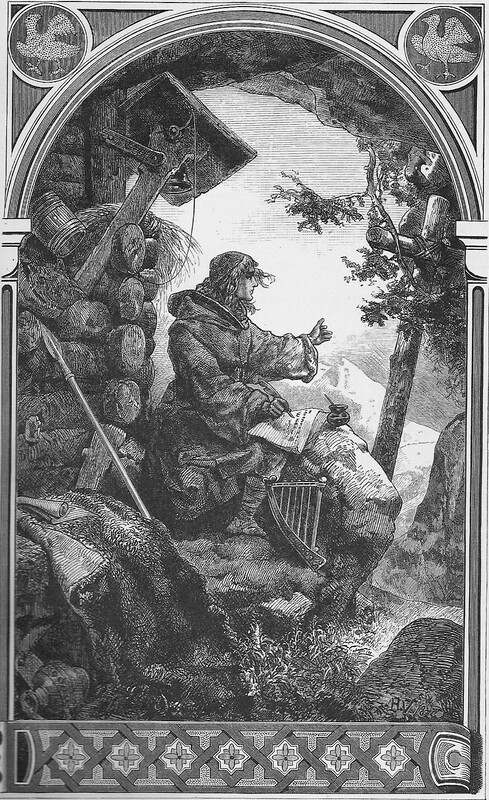 Zimmermann, Érire et lire, I pp. 82-83. 7. And of course Zimmermann wrote the basic synthesis on that event, so knows this perfectly well: “La prise de Barcelone par al-Mansûr et la naissance de l’historiographie catalane” in L’Historiographie en Occident du Ve au XVe siècle. Actes du Congrès de la Soci´té des Historiens Médiévistes de l’Enseignement Supérieur. Tours, 10-12 juin 1977, Annales de Bretagne et des Pays de l’Ouest Vol. 87 (Rennes 1980), pp. 191-218. 8. The family is set out by Prosper de Bofarull y Mascaró, Los Condes de Barcelona Vindicados, y Cronología y Genealogía de los Reyes de España considerados como Soberianos Independientes de su Marca (Barcelona 1836, repr. 1990), vol. I online at http://www.archive.org/details/loscondesdebarce01bofauoft, last modified 10 Jul. 2008 as of 15 Jan. 2009, I pp. 64-81; Borrell had Udina, Archivo Condal, doc. no. 173, additionally dated by the birth of his son, so I guess he was relieved. They do seem to have had a lot of girls. 9. Zimmermann, Écrire et lire, I p. 500, referring to Udina, Archivo Condal, doc. no. 160. 10. Zimmermann, Écrire et lire, I p. 82.